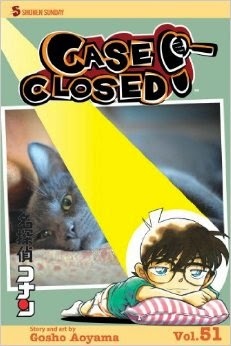 The 51st volume of Case Closed, known to most as Detective Conan, starts off with the concluding chapter of a story that began in the previous volume, in which Conan and Harley were reminiscing over the telephone about one of their first murder cases. Over a period of several years, two men apparently took their own lives while riding alone on a ski lift. They were shot through the head and a bag filled with snow was found next to them, which could be interpreted as a calling card of the malevolent snow spirit – whom reputedly haunts the white-topped mountain peaks of the region. I mentioned in my review of the previous volume I had a rough idea how the murderer pulled off this trick. Well, I was partially right, but nice to see how Aoyama took a different approach to create this illusion, because I was expecting something along the lines of the no-footprints trick from volume 20. However, the amount of familiar (side) characters and detectives crawling the slopes of that resort made Aoyama's bustling, ever-expending universe look like a small world after all. The second story can be filed away under filler material and consists of two chapters. Conan, Rachel and Richard Moore are enjoying some refreshments at Café Poirot when they are launched into a search operation for a missing child. The only clues they have to go one are a some cryptic text messages of which this was the last one, "I'm scared of dying like a fish in a net." It's short. It's simple. It's filler. But passable filler. In the third story, Doc Agasa takes Conan and the Junior Detective League along to the beach to dig around for clams. At the beach, they meet a group of college students and lovers of delicious shellfish, but they become very gloomy when a recent hit-and-run accident is mentioned. 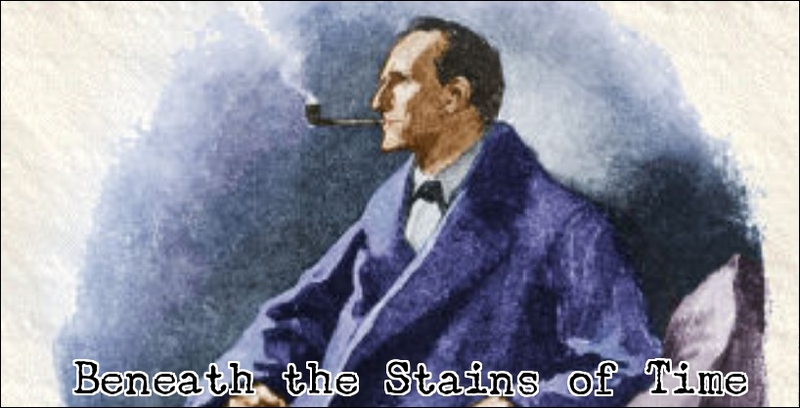 The one who appeared to have been constantly depressed is found not long after in what looks like a suicide, but Conan figures there's more to it than that and figures out how someone managed to poison a bottle of green tea without being observed – which makes this an impossible crime story and a pretty clever one at that. However, the best poisoning story (IMHO) from this series still comes from the 15th volume, in which a moneylender is administrated cyanide in his locked office building. The explanation is given in a chapter aptly titled, "The Devil's Summons." The next story is another short one, spanning only two chapters, which spoofs "Tortoiseshell Holmes," a cat-detective created by Jiro Akagawa, but being aware of the cozy cat detectives would be enough for us (Western readers) to appreciate this story. Moore has to baby-sit his wife's new kitten, Ricky, who's giving subtle hints that are helping him deciphering a coded text message for a client. These code-cracking stories are next to impossible to solve, but I managed to solve this one instinctively. Or, as I like to call it, "educated guesswork." Finally, the last three chapters form the last story of this volume and returns to one of the locations from volume 5, but the story turned out to be a bit of a disappointment – in spite of two different locked room mysteries. The first one concerns a window that was nailed shut from the inside, but can still be opened by a demon to peek out and this has been witnessed. This is followed by a hanging in a room of which the doors and windows were locked from the inside, but the tricks were as old as the house they were staged and there was a simple, elegant explanation for the second impossible situation. The hanging victim had a special key chain on her belt that attached the keys to a tape measure that stretches for three feet and springs back when you let go of it. It was suggested that the murderer pulled the key under the crack of the door, locked it, and let go of it – so it would spring back to her waist. However, the key wasn't found on the chain, but inside the room on top of a keyboard. It couldn't have been tossed under the crack of the door into the room. So how should it have been done? The key should've been replaced with a duplicate on the chain that looked different from the original key of the door. Maybe with a plastic cover over its head. Or a label reading, "office," or something. The original key was right there in the room, which would make it unnecessary to try if any of the other keys fitted the lock in the door. Especially if they appear to be for locks outside of the house. I know it sounds disappointingly simple, but not as disappointingly simple as the actual solution. Anyhow, this was a decent collection of stories with a dud at the end, but these collections are always fun to read and good stories to pick up your reading pace again after a short break. Yes, I'm still steady on schedule with being behind on all my reading. "If you drink much from a bottle marked poison it is almost certain to disagree with you, sooner or later." 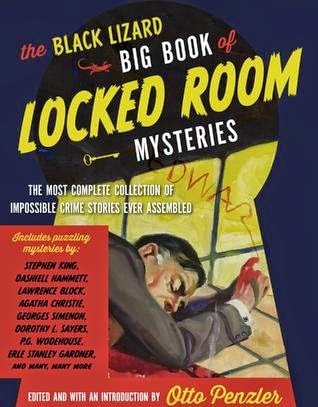 A few days later than anticipated, but finally was able to turn over the final page of Otto Penzler's mammoth-like anthology, The Black Lizard Big Book of Locked-Room Mysteries (2014), which packs nearly a thousand pages worth of impossible crime fiction in one book – from Edgar Allan Poe and John Dickson Carr to Edward D. Hoch and Bill Pronzini. - Uncage the Black Lizard, Part 6: Breaking and Entering. - Uncage the Black Lizard, Part 7: Closing the Book. The final four stories that round out this collection are, thinly, spread over the remaining two categories, One Man's Poison, Signor, is Another's Meat and Our Final Hope is Flat Despair, which borrowed from another locked room anthology to fill them. That I found to be slightly disappointing. "The Poisoned Dow '08" by Dorothy L. Sayers was originally published in the February 25, 1933, issue of The Passing Show and first collected in Hangman's Holiday (1933). Sayers is primarily known today for her creation of a well-bred, aristocratic amateur sleuth, named Lord Peter Wimsey, but not as well known is her creation of Montague Egg – a traveling salesman who lives by rules and wisdoms contained within the Salesman's Handbook. There are eleven stories featuring Montague Egg, which were collected in Hangman's Holiday and In the Teeth of the Evidence (1939), and the opening of this story is (as far as I remember) fairly standard for the series: Egg arrives at the home of a customer, Lord Borrodale, only to be greeted by a uniformed policeman. Lord Borrodale was discovered in his study, door locked from the inside and windows protected with burglarproof locks, succumbed to nicotine poisoning from a doctored bottle of wine. However, the sealed bottle was opened in front of Borrodale and, except for the victim, nobody seems to have had the opportunity to administrate the poison. Egg finds an explanation that would've received the nodding approval of John Rhode, but the clues left for the reader to reconstruct a complete picture were rather sparse. It's a pity Egg and Wimsey never collaborated together on a case. "A Traveller's Tale" by Margaret Frazer originally appeared in The Mammoth Book of Locked Room Mysteries and Impossible Crimes (2000), edited by Mike Ashley, which places an impossible situation in medieval England. A wine merchant, William Shellaston, his wife and young son are found dead inside a carriage, but none of their servants heard any outcry nor saw someone approaching the wagon – so how could someone have administrated poison to them? I think the situation in combination with its solution makes it closer related to an "How-Dun-It," such as Sayers' Unnatural Death (1927), but close enough to qualify as a locked room mystery. Fairly good, but not very memorable. I didn't remember anything from this story from my first reading, years ago. "Death at the Excelsior" by P.G. Wodehouse, of Wooster and Jeeves fame, was first published in the December 1914 issue of Pearson's Magazine, which I reviewed early last year – alongside some other uncollected short stories. You can read the review here. The final story is collected under Our Final Hope is Flat Despair and is accompanied by the following description, "some stories simply can't be categorized," which in this case isn't entirely true. I would file this story away under a good example of a Hoist On Their Own Petard and it came from the pen of a fellow mystery blogger, Connoisseur in Murder and successful crime novelist. "Waiting for Godstow" by Martin Edwards was first published in The Mammoth Book of Locked Room Mysteries and Impossible Crimes, which gives the reader a front-row seat to the unraveling of a common, garden-variety murder case from a local news item. Claire Doherty has convinced her hunky toy boy to bump off her cheating husband, Karl, in a hit-and-run "accident," but Karl turns up alive after the job was supposed to be done. What's more: Karl accidentally killed his old mistress! So how could her husband murder someone at one end of town when there were people who swore he was somewhere else, while yet another person is convinced he just ran him over with a stolen car. The only thing Claire can eventually do is waiting for Sgt. Godstow, who's never even aware that's handling an impossible crime. I think this story would've made a great template for an episode of Columbo or Monk. This was a good, solid round of stories to end a good, if uneven, collection of locked room mysteries, impossible crimes and miraculous thefts on. - The most frequently, over anthologized-and collected stories (e.g. Edgar Allan Poe's "The Murders in the Rue Morgue") are, by and large, contained to the opening column of stories. - Good introductions by the editor, Otto Penzler. - There were too many stories that repeated the same kind of tricks (e.g. icicle weapons, suicides disguised as murders and the same variations with time-and space manipulation), which can give new readers the impression the locked room is a one-trick pony. 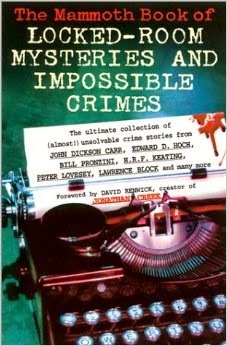 - Reprinted a number of stories originally written for The Mammoth Book of Locked Room Mysteries and Impossible Crimes, which is an anthology fans more than likely have already read. - There were, altogether, too many stories I had already read in this anthology. - Allowing John Sladek's "By An Unknown Hand," at the moment only available in Maps: The Uncollected John Sladek (2003), to escape, to be anthologized, yet again. I know there are a lot of mystery fans who'd love to read it, but don't want to buy a SF-collection for one detective story. Results may vary from reader-to-reader. I'll be back soon with a regular review.